In life, people meet under all kinds of circumstances. Often, these circumstances are expected. We make new friends in our social and work networks and we don’t think twice about it. Other times, however, a new connection seems to come out of nowhere. It’s the person you meet standing in line for coffee, the person you accidentally collide with on the street – or the person you meet one day while casually exercising at the gym. This is the story of David and Gregory. The year was 1997. Gregory Yurovitsky was working out at the gym like any other day when a young man appeared to ask him a question. Within minutes, Gregory found himself talking naturally and easily with David Danis. They became fast acquaintances and friends as Gregory gave David tips and pointers on exercising and working out. David’s mother recognized the connection that her son had with Gregory, and asked Gregory if he would be willing to guide and mentor her son more closely through his service agency, Better Community Living Inc. (BCL). Gregory said “sure” and he’s been helping to support David ever since. Twenty years later, Gregory has served as David’s mentor, friend, and even his roommate. When David needed a place to live at one point, Gregory opened his doors to him. 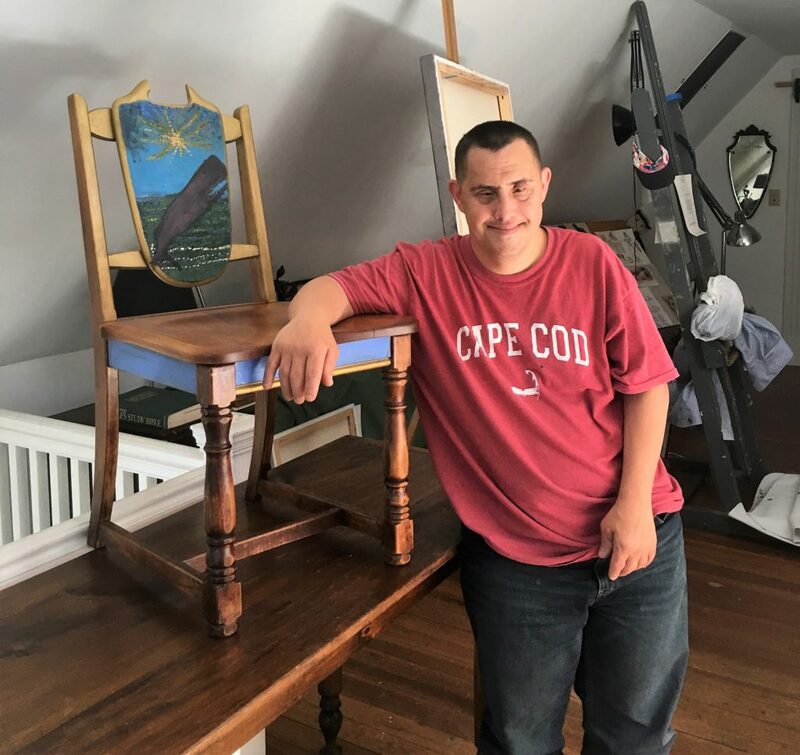 David repurposed and painted a chair he spotted on the side of the road! With the help of Gregory and his mother, David began practicing his craft. He met an art teacher at UMass Dartmouth and started receiving lessons from art students. Then, David’s mother found a local artist to assist as David’s art teacher and mentor. Today, David’s art can be found throughout the community. His paintings appear in businesses, like doctors’ and lawyers’ offices, and even in places he has worked. One painting hung inside Olive Garden for two years, and others hung inside the Hampton Inn where he also once worked. He’s received recognition too. One local Senator requested a painting for his office, and shortly thereafter honored David at the State House for his accomplishments. For twenty years, Gregory has been one of David’s greatest advocates. He not only supports David’s interests, but sees his potential on a daily basis. Gregory’s role has been instrumental to helping David lead a rich and fulfilling life. Today, Gregory and David still exercise at the gym together. “He’s very active. David likes to workout. He also likes to take long walks on the beach or in the park. We always have our phone or camera. When David sees something he likes, we take a picture, and we send it to his art teacher, and he paints it – local river, fields, or birds, or anything he likes,” Gregory says. 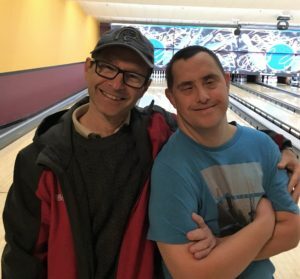 “He likes bowling too,” Gregory says, “and he’s really good at bowling. He used to be in the Special Olympics. He likes to play tennis too, and he always beats me because he’s so good. Right David?” David smiles. Further, the two have even traveled together all the way to Israel. David has family there, so both of them planned a trip and visited for two weeks to celebrate Passover together with David’s family. To support Better Community Living, Inc. and contribute to individuals like David, consider a small donation. BCL serves children and adults with disabilities. People like you help make our services available. To make a secure donation online, visit www.bettercommunity.com.